Already an icon in architectural circles, famed Catalan artist Antoni Gaudí may soon be receiving a new accolade: sainthood. Due to his renowned, unique style and tireless efforts on La Sagrada Família, Gaudi, potentially our first Patron Saint of Architects, will be beatified by Pope Francis within the next year. 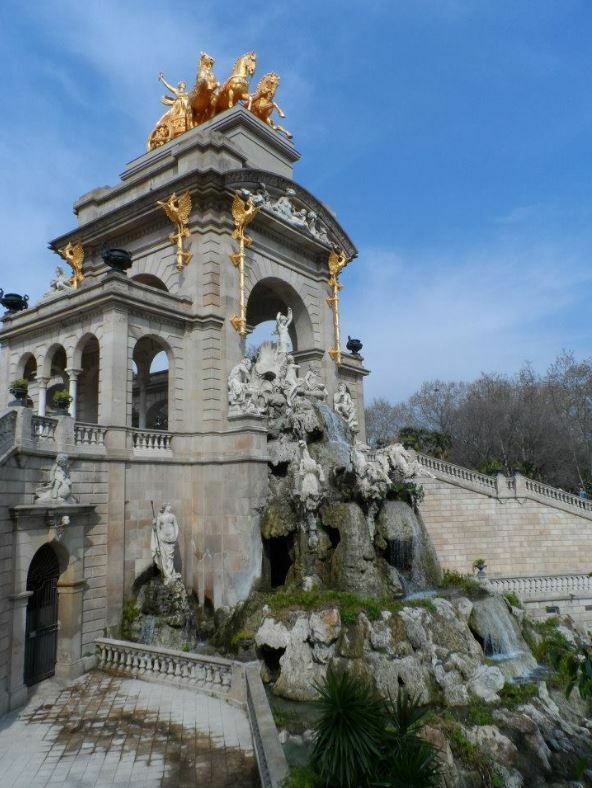 Designed by Josep Fontserè in 1881, with young Gaudí as his assistant, the Cascada Fountain, tucked into the northern corner of the Parc de la Ciutadella, draws inspiration from the Trevi Fountain in Rome. Two giant crab pincers act as stairs to a podium in the monument’s centre, where there is a sculpture of Venus inside an open clam. Gaudí was still a student of architecture when he helped construct the Cascada. When construction was completed in 1888, the fountain was shown at the Barcelona World Exhibition. The first of Gaudí’s significant commissions after he completed his degree, Casa Vicens was designed for ceramic factory owner Manuel Vicens. Built between 1883 and 1888, the building highlights several influences, particularly a Moorish influence, which is evident in the rooftop towers. The trencadís façade is constructed of undressed stone, red bricks and coloured ceramic tiles in checkerboard and floral patterns, paying homage to the owner’s profession. Although the design lacks the curved lines of his later works, the explosion of colour is heavily influenced by Arabic and eastern art, something that is echoed in many of his later designs. This palace residence of the Güell family has a distinctly sober façade, which is not immediately reflective of Gaudí’s other works. The building is centred around a main room, designed for entertaining the Güell family’s high society guests, who entered the residence in horse-drawn carriages via iron front gates. These arched gates feature intricate forged iron-work resembling seaweed. Animals were taken to the stable by a ramp within the room, whilst guests went upstairs to the receiving room. The ornate walls and ceilings here disguised viewing windows located high in the walls, allowing the homeowners the privilege of peeking at the guests so they could decide whether to adjust their attire before making their entrance. The interior certainly compensates for the sombre exterior: a parabolic dome-shaped central hall with tiny holes in the ceiling allowed daylight to dapple the room with a planetarium-like effect. La Pedrera is one of Gaudí’s most well-known residential constructions and the last of his civil works. It was built between 1906 and 1912 and, despite an undulating stone façade and twisted iron balconies, which made it controversial at the time, was recognised as a World Heritage site in 1984. Casa Milà is made up of two buildings, structured around two courtyards that offer light to the houses’ nine levels. The main floor was intended for the commissioning family, whilst the remainder was split into over 20 rental properties. The exterior’s impressive mass of rippling limestone explores the irregularities of the natural world. Upon entering the building, this theme is again echoed. The columns and floors devoid of load bearing walls were also remarkable architectural innovations for the time. The roof is spectacular, crowned with chimneys, skylights, exits and fans. The chimneys were coated in limestone, broken marble and glass, and were twisted to allow more smoke to escape. The view from the roof is also worth the nine flight climb. Another of Gaudí’s residential buildings, Casa Batlló, reconstructed in 1904 from a house built in the 1870s, was designed for the aristocrat Josep Batlló, who moved his family into the lower two floors before renting the remaining space as apartments. The attention to detail is captivating: windows vary in size, dependent on the height of the floor from ground level, and the intricate exterior designs and colours are inspired by marine life. From a distance, the balconies and supporting pillows look like skulls and bones, adding to the naturalistic feel. 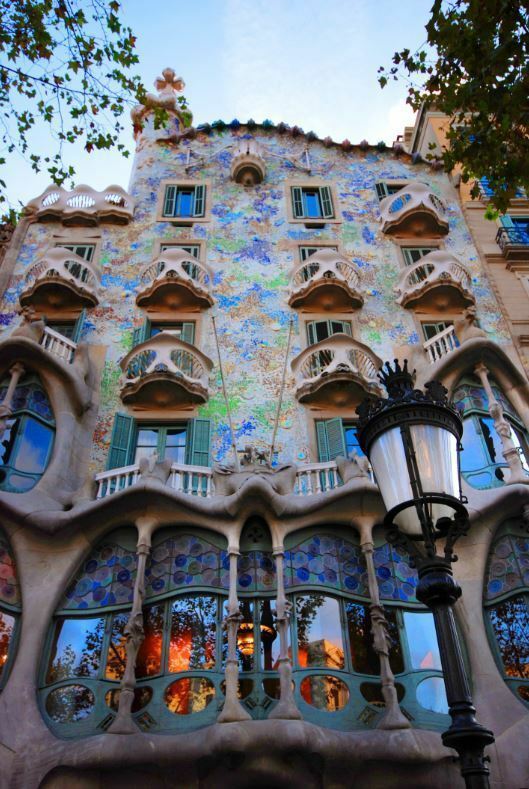 As with Casa Milà, the building was criticised during construction for its radical design; however, it was announced as one of Barcelona’s best three buildings by the city council in 1906 and is now on the UNESCO World Heritage list. This stunning garden complex on the hill of El Carmel was commissioned by Eusebi Güell and built between 1900 and 1914. Although today part of the UNESCO list ,’Works of Antoni Gaudí,’ the park was originally an unsuccessful housing site intended to exploit the fresh air and city views. Only two of the planned 60 houses were erected; after no buyers came forward, Gaudí bought one and moved in with his family. There are numerous architecturally fascinating aspects to explore: the columns shaped to simulate palm trees, rubble surfaced arches growing from the ground, a gazebo fashioned from twisted angle iron. However, the focal point of the park is the main terrace, due to its stunning views and surrounding mosaic benches. 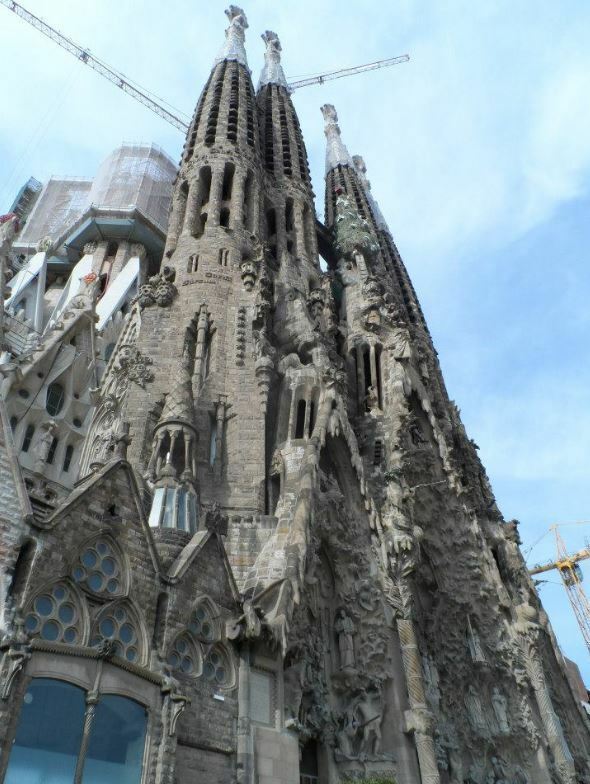 The spectacular Sagrada Família has been under construction for over a hundred years, since work began in 1882. Gaudí had an incredibly active role directing the construction of this magnificent Roman Catholic Church until his death in 1926, when only a quarter of the project was complete. Following the Spanish Civil War in 1936, much of his workshop, along with models and plans, were destroyed by Catalan anarchists. Thus, parts of the present design have been based on reconstructed versions and modern adaptations, causing controversy amongst many Catalan architects who argue that these alternative materials disregard Gaudí’s original proposal. The exterior and interior designs are incredibly intricate, with themes drawn from phrases from the liturgy. The towers are decorated with words like ‘Excelsis’ and ‘Sanctus’ and the door is covered in biblical words written in various languages. Construction has recently accelerated thanks to computer assisted design technology that allows the stone to be shaped off-site using a CNC milling machine. Prior to this, it was carved entirely by hand. Despite its incomplete state, the church has been recognized as a UNESCO World Heritage Site. A Gaudí Guide to Barcelona originally appeared on ArchDaily, the most visited architecture website on 25 Jun 2014. Roof architecture at Casa Batlló.